Home Match Our Spurs team to face Man Utd – What’s yours? 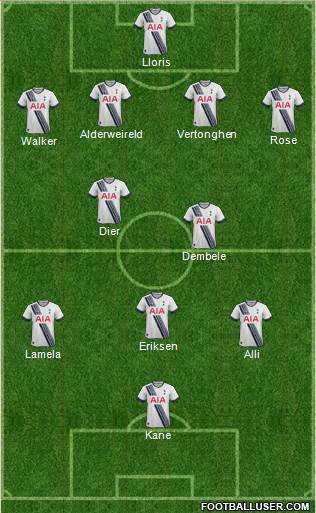 Our Spurs team to face Man Utd – What’s yours? Spurs face Manchester United today and Mauricio Pochettino could have the opportunity to field his strongest side. If Jan Vertonghen has passed his fitness test he will be available to face United. There is a debate as to whether it makes sense to disrupt the back four considering that Kevin Wimmer has been playing so well in Vertonghen’s absence, but we can’t see the point of postponing the inevitable if the Belgian is fit. The other change we’d like to see is Erik Lamela returning to the right in place of Heung-Min Son. Here’s our Spurs team to face Manchester United. What’s yours? That’s the dream team alright but I’d be surprised if MoPo drops Wimmer for Verthongen straight off the bat in a game of this importance, bearing in mind how long Verts has been out for. That’s as good a team as any in the PL. All we need now is similar strength off the bench.